-	Your thoughts on keeping your code S spot? It feels great. I mainly focused on preparing for the TvT, so I am happy I was able to win that. -	It feels like you don’t like to attack even when you are ahead. My style is originally like that. -	Do you feel the need to change your usual style? I planned to do so when I got further in the tournament, but I keep falling quickly so I haven’t done that yet. -	Your thoughts on why you won today? I don’t think my opponent prepared for the TvT as much as me. -	Reasons for your poor performance this season? It is because of terrans. My TvT isn’t so good, but my opponents (in the code S group) were all terrans. I don’t think the group itself was that bad, but it happened to be all terrans which made it bad for me. -	If you face terrans again in the future? -	Your goals going into code S? This time for sure, I need to make it at least to the round of 4. I hope the group nominations go well. I don’t want to face terrans. -	Any players you don’t want to face? All the terrans. I don’t want to face any of them. -	What do you think about the 1.3.3 patch? I like it because the ghost, a unit I like, has become cheaper (gas-wise). My birthday was on Parents day. It feels like my gift was getting back into code S, so I am happy. One of the players that I used to live with during my Hwaseung days, NeeL, has decided to switch to SC2 so I wish him luck in that. I want to thank Coca, LosirA, sC, Hack, and Maka for helping me practice. - 좋다. 테란전을 거의 준비 안하고 왔는데, 이겨서 좋다. ▼ 유리한 상황에서도 공격을 잘 안하는 것 같던데? ▼ 스타일 변화의 필요성을 느끼진 않나? - 좀 더 높이 올라가면 하려했는데, 자꾸 일찍 탈락해서 못하고 있다. - 상대가 나처럼 테란전을 준비 안한 것 같다. ▼ 이번 시즌 부진의 원인은? - 테란 때문이다. 테란전 성적이 좋지 않은데, 상대가 모두 테란이었다. 대진운이 나쁘다고 생각하진 않았는데, 테란인 것 자체가 안 좋았다. ▼ 다음에 또 테란을 만난다면? - 이번엔 진짜로 꼭 4강에 가야한다. 대진운이 잘 나오길 바란다. 테란하고 만나기 싫다. - 테란은 전부 다 싫다. ▼ 1.3.3 패치에 대해선 어떻게 생각하는가? - 좋아하는 유령이 더 싸져서 좋다. ▼ 마지막으로 하고 싶은 말은? - 어버이날이 생일이었다. 그 선물로 코드S 진출한 것 같아 기쁘다. 화승 때 같이 생활하던 강동현 형이 스타2를 시작했는데 잘했으면 좋겠다. 연습을 도와준 최종환, 황강호, 김승철, 김영일, 곽한얼 선수에게 고맙다. -	Your thoughts on making it into code S? It feels like I just started my life as a SC2 progamer. I will not rest because I made code S, but play harder to show even better games in the future. -	Did you predict that you would advance today? 100%. I predicted that I would beat Check. At first, I thought I should practice TvT, but I didn’t think that would help that much. If I practiced a lot for that match and lost, I my psyche going into the last match would have been bad, so in the end, I mainly practiced for my TvZ. I don’t think I would have felt that pressured even if I lost the first game in that series. -	It felt like you could have won the first game. I was lacking in practice, and I was just letting my play go where my hands went. I didn’t have much desire to win that set. -	Your banshee cloak upgrade was a bit disappointing in the 1st game. It is a build I use often on the ladder. My opponent was so well prepared for the strategy so I was a bit shocked. -	Who do you want to face in code S? I will leave that up to chance. If possible I want to avoid terrans. I want to face either protosses or zergs. I usually have a bad time against zergs in practice, but do well against them in real matches. -	Your ambition going into code S? Even if I lose my games against code S players, I don’t think my feeling will be hurt that much. I want to get to the finals stage with a smile on my face. In the group nomination, if they pick me, ‘I will send them away.’ (laugh). At first glance, it looks like protoss is becoming weaker, but I don’t think that is necessarily the case. I don’t like the change on the bunker. I feel like to be fair, they should also nerf zergs. I think the balance right now is just right. -	There is a lot of talk about zergs being the weakest race. If you play zerg like Nestea, then you can win. Also, if you are good at using infestors, both terrans and protosses will have a hard time. I want to thank my team members for their continual support and interest. I wasn’t able to go back home for parents day and only talked with them on the phone, so I will try to make up for that here. I want to say that I love them. - 스타2 프로게이머의 첫 시작 같다. 코드S에 만족하지 않고 앞으로 더 좋은 모습 보여드리겠다. - 100%. 형주형을 이길 것이라 예상했다. 원래 테테전을 연습하려고 했는데, 소용이 없을 것 같았다. 지면 마인드컨트롤이 안될 것 같아서 저그전만 준비했다. 1경기를 졌어도 부담되지 않았다. ▼ 1경기도 승리할 수 있었는데? - 준비가 부족했던 것도 있고, 손 가는대로 했다. 욕심이 별로 없었다. ▼ 1경기에서 밴시의 은폐 업그레이드가 아쉬웠는데? - 래더 때 자주 쓰는 빌드다. 상대가 거기에 맞춰서 나오니 당황스러웠다. ▼ 코드S에서 겨루고 싶은 선수는? - 운명에 맡기겠다. 웬만하면 테란전은 피하고 싶다. 프로토스나 저그와 붙고 싶다. 저그 상대로는 연습 때 잘 안되는데, 대회에선 잘 된다. - 프로토스가 약해질 것 같으면서도 아닐 것 같다. 벙커는 마음에 들지 않는다. 저그는 약해져야 마땅하다. 지금이 밸런스가 딱 맞는 것 같다. ▼ 저그가 약하다는 소리가 많은데? - 저그는 재덕이형처럼 하면 이길 수 있다. 감염충만 잘 쓰면 테란, 프로토스 모두 힘들다. - 항상 관심과 사랑을 주시는 우리 팀 선수들에게 고맙다. 어버이날에 집에 못가고 통화만 했는데, 이렇게 다른 방법으로 효도한 것 같다. 사랑한다는 말 전해드리고 싶다. I have been losing against terrans recently, so I wanted to face one. I want to thank Lee Joon Ho the game director, for drawing a terran against me in the up and down group nominations. -	How did you overcome your PvT problems? I have practiced a lot. I practiced with terrans that I consider to be at the top. My win rate was around half in practice, but since I practiced against the best, I built confidence in this matchup. It has been hard since they removed the amulet upgrade. -	You had many dangerous situations in the 1st set. I block those kinds of rushes pretty well on the ladder. I have lost to them on broadcasted matches because of my overconfidence, and I believe my opponent was aiming for that as well. Players that know me very well do not use those builds against me. I usually thank my opponent if he opens like that. Although, when my sentry was caught, it reminded me slightly of my match against Marineking so I was panicked for a little bit. -	In the 2nd set, you were able to stop your opponent’s strategy well. TSL’s Puma and my team’s TOP are very good at using medivac play. In my practice, I was able to improve my defense in stopping medivac play. I think I was able to stop it well today due to my practice with those players. -	You are/were playing in foreign tournaments at the same time as this one, is that tiring? It may sound like an excuse, but I have had weeks where I have had to play 6 different matches. Even if you have a base skill that you can fall back on, you have to prepare for the matchup to be fully ready. I wasn’t able to do that, while my opponents were able to practice focusing for the game against me. I think in that aspect, it has been very tough. But I was able to get some good results in one or two tournaments so I am thankful for that. 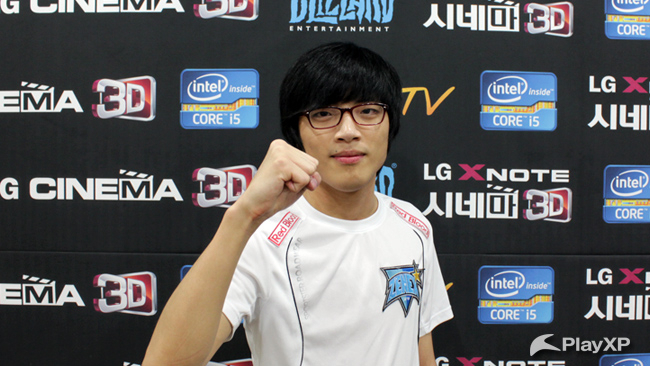 -	What do you think about your record against Polt? Since he is 4-0 against me, it feels right to call him my nemesis but I am not afraid of him. Rather, I was a bit disappointed since he lost so quickly after winning against me. I hope next time we can advance together. -	You probably have some greed for the upcoming super tournament, right? I thirst to be at the top of the money leader board. 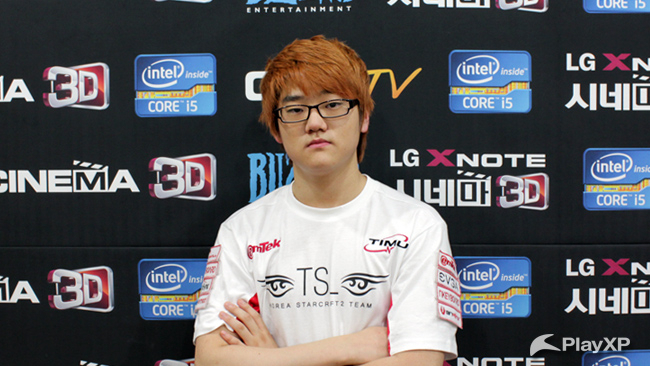 I also want to win and regain my spot as the 1st in the GSL point rankings. But I think because of the new patch, I may have a bit of a tough time. With the buff on the spore crawler and the reduced pylon radius zergs will have an easier time against protosses. Also the warp gate nerf will have a big effect in terran matchups. I think protosses will have to put a lot of thought into researching different builds. But for now, I predict that protoss players’ results will be a bit worse. -	Any players you want to face in the super tournament? I want to face Nestea and Mvp. If I were in the finals right now, I guarantee I would crush Nestea in the matchup. Inca hasn’t really found his rhythm for the PvZ matchup yet, but since I won today, I am going to go and help him prepare for his match. -	Are you helping Inca right now? I spectate many of his matches and give him advice. Inca has changed his attitude and now is someone who takes advice very well from other players. I have some obligations on the day before the finals so I will not be there, but I will make sure to help him as much as I can for the finals. 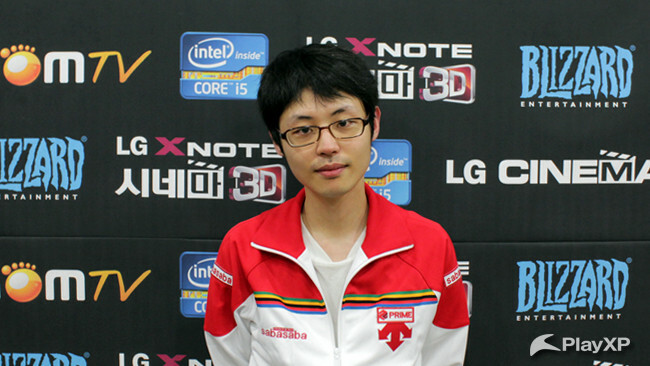 -	Jinro fell yesterday in his group, what is the consensus on his problems at the team house? We feel like he is stuck in the past. He is using builds that are old and it is disappointing that he has stalled a bit. But I hope he can practice with a smile on his face. I want to thank him for taking his losses well, and hope that he can quickly return to code S.
-	What do you think is the difference between foreign players and Korean players? Korean players have a strong fighting spirit, especially when there is large money on the line. And originally, I thought that foreign players have a tendency to stick with builds that they are very comfortable with (**really good at). I think some of Jinro’s problems have come from that aspect. But ThorZaIN who I faced recently, used a variety of builds in the match to embarrass me. I think that foreign players will have to emulate the same burning fighting spirit as the Korean players, and the Korean players will have to emulate good playing aspects from the foreign players. I have repeated as champ, quick exit, champ, quick exit. So I guess it is time for me to win again. I have been a bit disappointed since I have been losing so much recently. I know that many of my fans are worried about that, and so I haven’t been sleeping that well. But I want to thank the captain, coach, and manager for putting in a lot of effort for me and the team. I am happy that Inca was able to get to the finals, and I want to wish Huk a happy birthday. My girlfriend worries a lot for my games so I want to thank her as well. I will try my best to not show games of which I would be ashamed. Haypro will be soon leaving us, so I want to wish him well and hope that he takes care of himself. - 테란한테 많이 져서 테란과 하고 싶었는데, 이준호 팀장님이 추첨 때 테란을 뽑아주셔서 감사드린다. ▼ 테란전 극복은 어떻게 했나? - 연습을 많이 했다. 내가 생각하는 최고의 테란 선수들과 연습을 했다. 승률은 반 정도였지만, 최고들을 상대로 연습해서 자신이 있었다. 부적 삭제 후 힘들었다. - 래더에서 그런 러쉬를 잘 막는다. 방송에서 방심하다 당한 적이 있는데, 그걸 노리고 한 것 같다. 나를 잘 아는 사람들은 그런 빌드 잘 안 쓴다. 상대가 그렇게 나오면 고맙게 생각한다. 파수기가 잡혔을 때 정훈이와 했던 경기가 생각나서 잠깐 당황했다. ▼ 2세트에서 상대의 견제를 잘 막던데? - TSL의 이호준, 우리 팀의 김정훈 선수가 의료선을 정말 잘 쓴다. 이번에 연습하며 의료선 막는데 도가 튼 것 같다. 두 선수와의 연습 덕분에 잘 막을 수 있었던 것 같다. ▼ 해외대회와 병행, 힘들진 않았나? - 핑계라고 할 수도 있지만 1주일에 최대 6경기를 가진 적이 있다. 기본 실력이 되더라도 준비를 할 수 있어야 하는데, 그러지 못했고, 상대는 나와의 경기만 준비했다. 그런 부분에서 힘들었다. 그래도 한두 개 대회에선 좋은 성과를 거둬서 다행인 것 같다. ▼ 최성훈 선수와의 천적관계는 어떻게 생각하나? - 4:0이니 천적은 맞는 것 같지만 무섭진 않다. 오히려 최성훈 선수가 일찍 탈락해서 아쉬웠다. 다음엔 같이 올라갔으면 좋겠다. ▼ 슈퍼토너먼트에 욕심이 날 것 같은데? - 상금랭킹에 많은 욕심이 난다. 우승하고 GSL 포인트 1위 자리를 탈환하고 싶다. 이번에 패치 때문에 조금 고생할 것 같다. ▼ 1.3.3 패치에 대해 어떻게 생각하는가? - 포자촉수나 수정탑 범위 때문에 저그가 프로토스전을 하기 수월해질 것 같다. 테란전은 차원관문 너프 된 게 클 것 같다. 프로토스는 연구를 많이 해야 할 것 같다. 당분간 프로토스 선수들의 성적이 안 좋을 것 같다. ▼ 슈퍼토너먼트에서 만나고 싶은 선수는? - 임재덕, 정종현과 만나고 싶다. 내가 만약 결승에 올랐다면 재덕이형을 쉽게 이길 수 있을 것 같다. 준혁이가 저그전 감을 아직 못 찾았는데, 오늘 이겼으니 가서 도와주겠다. ▼ 송준혁에게 도움을 주고 있나? - 연습 때 관전하며 조언을 많이 해준다. 준혁이도 마음을 바꾸고 다른 선수들의 조언을 많이 듣는 편이다. 결승전날 사정이 있어서 못가지만 열심히 도와주겠다. ▼ 어제 조나단 월시가 패배했다. 팀 내에서 생각하는 문제점은? - 과거에 집착하는 것 같다. 빌드도 오래됐고, 과거에 머무르고 있는 것 같아 안타깝다. 웃으며 연습했으면 좋겠다. 요즘엔 화를 잘 안내서 고맙고, 다시 코드S로 올라왔으면 좋겟다. ▼ 해외 선수들과 한국 선수들의 차이점은 뭐라고 생각하나? - 한국 선수들은 투쟁심 강하다. 돈이 걸려있는 대회면 특히 그렇다. 해외 선수들은 단 한 가지 빌드를 고집하는 성향이 강하다. 조나단도 그래서 약점이 노출 된 것 같다. 내가 상대했던 ‘ThorZaIN’은 여러 빌드를 섞어서 난감했다. 해외 선수들은 우리 선수들의 투쟁심을 본받아야 하고, 우리 선수들도 해외선수들의 장점을 본받아야 할 것이다. - 우승, 광탈, 우승, 광탈을 반복했다. 이제 다시 우승을 해야겠다. 최근에 많이 져서 아쉬웠다. 걱정하는 팬분들도 많고, 최근에 잠도 많이 못 잤다. 단장님, 감독님, 코치님이 신경 써주셔서 감사드린다. 준혁이가 결승에 가서 기쁘고, 오늘이 크리스의 생일인데 축하한다. 여자친구가 걱정을 많이 해주는데 정말 고맙다. 실망스러운 경기력은 안 보여드리기 위해 노력하겠다. 헤이더 후세인 선수가 곧 떠난다. 몸 조심히 잘 갔으면 좋겠다. I am feeling pretty bad since the 2nd set was so awful. I was on a different schedule yesterday, so I wasn’t able to practice too much. So my plan was to end games early. But I didn’t think my long game macro was that bad…If I don’t fix that aspect of my play, I feel that I will quickly return to the up and down matches. -	Your early attacks were pretty successful. I saw the games that MC played (with Ryung) and he didn’t use any void rays. So in the 1st set, I chose void rays. I chose phoenix in the later set, because that strategy is not used too much on the ladder by other players. -	Your reason for your poor performance this season? When I practiced for my match against Kyrix, I practiced against a variety of zerg strategies, but I didn’t think he would just produce mass roaches. If I had to face MC today, I was planning to only 4 gate because of my last meeting with him. I am really happy about the archon change. But I am a bit disappointed since Protoss will lose a main strategy (4 gate). I am sad about that as a protoss player since the possibility of that strategy kept protoss in a favorable situation and now, that will disappear. -	How are you feeling recently? My waist/hips feel bad recently. Recently, I have been trying my hardest. But my body isn’t allowing me to do whatever I want. -	Do you have any players you want to face or avoid in code S? I don’t care who I face. My goal is to advance as far as possible. I think revealing who you don’t want to face reveals something about yourself as a player. -	Your goal in code S? My thought is to advance as far as possible. I was disappointed since my parents were cheering me on during the round of 32 and I lost. But I am thankful that I am back in code S. Parents day has passed but I want to say again that I am so thankful to them for raising me. I want to also thank Clide and Maka for helping me practice. - 2세트 경기 내용이 너무 안 좋아서 기분이 그렇게 좋지가 않다. 어제 다른 스케줄을 소화하느라 준비를 많이 못했다. 이번 경기는 모두 벼락치기였다. 그래도 장기전 능력이 이 정도까진 아니었는데, 빨리 고치지 못하면 다시 승강전으로 내려올지도 모르겠다. - 장민철 선수와 경기를 보니 공허포격기를 배제하고 하더라. 그래서 1세트에 공허포격기를 선택했다. 불사조는 래더에서 다른 선수들이 잘 안 쓰더라. 그래서 사용했다. ▼ 이번 시즌 부진했던 이유는? - 한준 선수와의 경기를 준비할 때 저그의 모든 전략을 연습했는데, 그렇게 바퀴만 올 줄은 몰랐다. 민철이와 하면 이기든 지든 지난 시즌 참고해서 4차관만 하려고 했다. - 집정관은 매우 만족스럽다. 프로토스가 전략적인 수가 하나 없어져서 아쉽다. 동족전에선 불쾌하지만 타 종족전에선 유리했던 건데 없어지게 돼서 하향이 된 것 같다. ▼ 최근에 몸 상태는 어떤가? - 허리가 안 좋았다. 최근에 열심히 관리하고 있다. 마음대로 몸이 따라주질 않는다. ▼ 코드S에서 만나거나 피하고 싶은 선수는? - 아무나 상관없다. 높이 올라가는 게 목표다. 누구를 피하고 싶어 한다면 이미 그 선수의 한계가 드러난 것이라고 생각한다. - 최대한 많이 올라가야 한다고 생각한다. - 부모님이 응원해주셨는데 32강에서 탈락해서 아쉬웠다. 다시 올라가서 다행이다. 어버이 날이 지났지만 낳아주셔서 정말 감사드린다고 말하고 싶다. 연습을 도와준 한규종, 곽한얼 선수에게 고맙다. So only 2 Liquid players going to be left in Korea, and didn't Jinro say he would leave if he dropped to Code A somewhere? Doesn't look good for Liquid-oGs house ! Aww yeah, MC shout out to Thorzain! <3 MC being very modest and nice guy.. This is sarcasm right? It's a little insulting to say he can simply crush Nestea. I'm talking about the way he treats his teammates like helping Inca, wishing HuK happy bday etc, lol. we all know that sc2 is competitive and Nestea fans will be unhappy about his confidence in crushing Nestea.. well that somehow shows his confidence in his PvZ match up and I see nothing wrong with that. Pretty weird to have MC break the news of haypro leaving in an interview, he should know better. Is he not going to attempt to qualify one more time at least? I like mc's comments about how foreigners and koreans play styles differ. Koreans will do anything to win, whether an unpopular choice (from fans perspective) or not. Foreigners play steady and never really falter from that path. Unfortunately competition is all about winning. Good quality is a by product of competition, not a main goal. modest? i only see truth and confidence ( crush nestea ?? ), when has he not been nice btw? <3 MC, altho I'm pretty sure he's just posturing about being able to crush Nestea, just as Nestea says toss<him now. Also, rofl poor HongUn was interviewed too, wasn't he? Jinro's not leaving. He said that he would stay as long as he had Code S, but that doesn't necessarily mean he would leave in Code A. Also he said he's not leaving in the Fan Club. It was just an observation. I don't, obviously, particularly care how the news is broken. Also I just realized next code A qualifiers won't likely be in a while as gstl/super tournament will be next, so perhaps haypro indeed will leave before the qualifiers. terrific mc interview. the interviewer asked all the right questions. As for Haypro, I've heard he doesn't practice much anyway.